In December 2013, the City of Cambridge created the “Getting to Net Zero Task Force” charged with advancing the goal of putting Cambridge on the trajectory towards becoming a “net zero community”, with focus on carbon emissions from building operations. This includes reducing energy use intensity of buildings and taking advantage of opportunities to harvest energy from renewable sources. The Task Force was assigned to study the technical aspects of greenhouse gas emissions from buildings in greater detail and develop comprehensive, actionable, long and short term recommendations. In June 2015, the Net Zero Action Plan was adopted by City Council. Read the Summer 2018 Newsletter for more information on current progress. Stay Connected! Join the Net Zero Mailing List for plan implementation updates. The Community Development Department is committed to reporting annually on progress towards implementation of the Net Zero Action Plan (NZAP). Fiscal Year 2017 (July 2016 - June 2017) is the second year of NZAP implementation. Actions therefore focused on continued study of program feasibility and design along with initial pilot program implementation. FY17 included actions in all five categories: Action 1 - Energy Efficiency in Existing Buildings, Action 2 - Net Zero New Construction, Action 3 - Energy Supply, Action 4 - Local Carbon Fund, and Action 5 - Engagement and Capacity Building. Key accomplishments include launch of the Multi-Family Energy Efficiency Pilot program, completion of the Low Carbon Energy Supply Strategy study, and initial investigation of a potential Local Carbon Fund. The report gives a status update of each action, and also summarizes initial quantitative indicators which can serve as baselines for measuring future progress towards achieving GHG emissions reductions through the Net Zero Action Plan. Click here for the FY2017 Net Zero Action Plan Annual Report. The Community Development Department is pleased to share the results of the Low Carbon Energy Supply Strategy study. The City of Cambridge engaged a consultant team led by Ramboll to undertake a Low Carbon Energy Supply Strategy study in support of the City’s commitment to reach carbon neutrality by 2050. The purpose of the study was to determine current and future energy demand, assess the potential for renewable energy generation in Cambridge, develop technical scenarios for renewable energy delivery systems, and evaluate the risks, benefits, and feasibility of each scenario along with discussion of potential implementation pathways. The Community Development Department is pleased to share the Fiscal Year 2016 Net Zero Action Plan Progress Report. 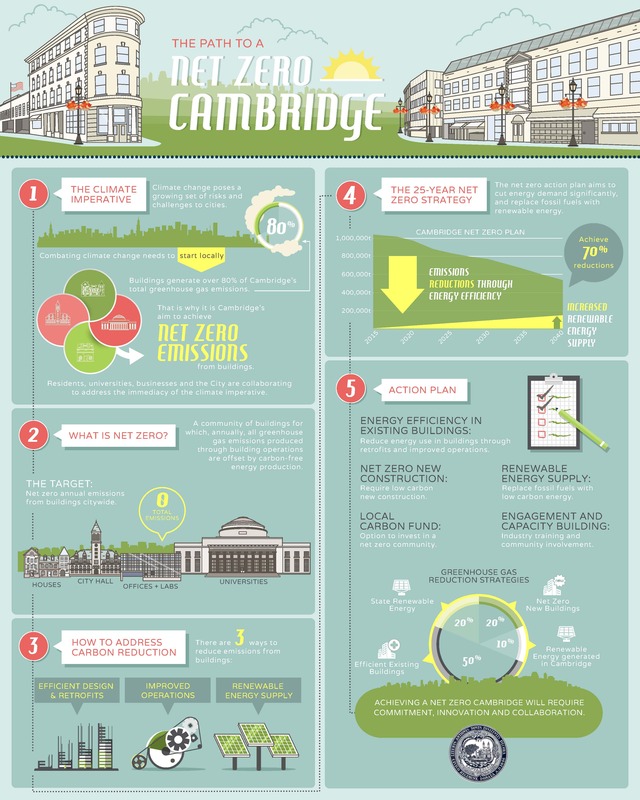 The Net Zero Action Plan aims to set Cambridge on the trajectory towards zero greenhouse gas emissions from buildings over a 25-year period. FY16 is the first year of Net Zero Action Plan implementation. Most of the actions therefore focus on studying the feasibility and design of action categories. FY16 included actions in four of the five categories: Action 1 – Energy Efficiency in Existing Buildings, Action 2 – Net Zero New Construction, Action 3 – Energy Supply, and Action 5 – Engagement and Capacity Building. Significant progress was made in each of these areas, including planning for the renewal of municipal buildings, initiating a low carbon energy supply strategy, and developing a communication strategy. The report gives a status update of each action, and also summarizes initial quantitative indicators which can serve as baselines for measuring future progress towards achieving GHG emissions reductions through the Net Zero Action Plan. The City Council unanimously voted to adopt the Net Zero 25-Year Action Plan and also request that language be drafted and referred to the City Council to include LEED gold + points. Updates to the LEED requirement will be before the Council late summer/early fall. The Health and Environment Committee, chaired by Councilor Leland Cheung, held a public hearing on Tuesday, June 9 in Sullivan Chamber, City Hall. The purpose of the hearing was to discuss a proposed framework for the goal of setting Cambridge on the trajectory to becoming a “net zero community.” The Committee voted to approve the net zero action plan and also request language to change the LEED requirement in the zoning code by the Council’s summer meeting (August 10). Click here for a summary of the Committee Report. The Net Zero Action Plan has been completed and sent to the City Council as part of the City Manager's Agenda for Monday, May 4. Upcoming meeting of interest: Thursday, April 16, 2015 from 6:00 P. M. to 8:00 P. M. at the Citywide Senior Center, 806 Massachusetts Avenue, 1st Floor Ballroom. This is the last scheduled meeting of the Net Zero Task Force. After this last meeting, the Task Force's recommendations will be submitted to the City Manager. It is anticipated that in early May the City Manager will forward the recommendations to the City Council for discussion. Join us for a public forum on The Path towards a Net Zero Cambridge featuring the Net Zero Task Force and a presentation of their 25-year action plan for reducing greenhouse gas emissions from building operations citywide! The purpose of this forum is for Task Force members to present their recommendations to the public followed by a question and comment session. This is an opportunity for the City to solicit public input and support on the Task Force’s recommendations as well as receive feedback on issues of concern. See the draft action plan below! CANCELLED: Net Zero Task Force meeting. Wednesday, February 11th from 6:00 P. M. to 8:00 P. M. Location and details to follow. Upcoming meeting of interest: Wednesday, January 28, 2015 from 6:00 P. M. to 8:00 P. M. at the Citywide Senior Center, 806 Massachusetts Avenue, 1st Floor Ballroom. Details to follow. Interim Net Zero Task Force Meeting: Monday, January 12, 2015, 11:30AM to 1:30PM at 344 Broadway, 2nd Floor Conference Room. We will be hosting an interim Net Zero Task Force meeting to continue discussions on the draft bold moves action plan. For more information on the draft bold moves plan, go to the "Presentations & Meeting Materials" Tab to review the December 10 meeting minutes and presentation. Upcoming meeting of interest: Wednesday, December 10, 6:00 P. M. to 8:00 P. M. at the Citywide Senior Center, 806 Massachusetts Avenue, 1st floor ballroom. Public Forum: Getting toward Net Zero, 6:00 P. M. to 8:30 P. M.
Join us for a discussion at the Cambridge Main Public Library, Lecture Hall, 449 Broadway: Getting toward Net Zero featuring guest panelists and big ideas for reducing carbon emissions from buildings. The purpose of this forum is for the City to present the Net Zero Task Force's preliminary ideas to the public followed by guest expert analysis and feedback in addition to public comment. Panelists will craft an objective response to the preliminary ideas and offer recommendations moving forward. This is an opportunity for the City to solicit public input on the preliminary ideas as well as receive feedback on issues of concern. Net Zero Task Force Upcoming Meeting of Interest: Wednesday, August 6, 6:00 P. M. to 8:30 P. M. at the Citywide Senior Center, 806 Massachusetts Avenue. Check out the Policy Best Practices Report, click here. Net Zero Task Force Upcoming Meeting of Interest: Wednesday, June 25, 6:00 P.M. to 8:00 P.M. at the Citywide Senior Center, 806 Massachusetts Avenue. Please note the location change. The most recent Net Zero Task Force meeting was held on Wednesday, June 4, 6:00 P. M. to 8:00 P. M. at the Main Library, 449 Broadway in the Community Room. Task Force members discussed the ideas from each of the four working groups. Working Group facilitator, Barbra Batshalom led the discussion in which Task Force members clarified their concerns and shared ideas that excite them most. In addition, Integral Group's, Rachel Moscovich proposed a 2014 engagement plan. The meeting concluded with public comment in which attendees raised concerns and shared new ideas for consideration. The May Net Zero Task Force meeting was held on Wednesday, May 14, 2014 at the Citywide Senior Center. Members from each of the four working groups reported back to the Task Force. In addition, Integral Group project consultant presented an overview of energy supply and renewable energy options. The meeting concluded with a group exercise to help develop an engagement strategy over the course of the year. The third Net Zero Task Force meeting was held on April 9, 2014 at Cambridge City Hall, Sullivan Chamber. Members from each of the four working groups reported back to the Task Force. In addition, Dave Ramslie, Integral Group, led a discussion of early action items and recommendations and Paul Gromer, Peregrine Energy Group, presented a preview the Cambridge Building Energy primer. All meeting materials may be found under the "Presentations & Meeting Materials" tab. The first meetings of the Net Zero Task Force Working Groups were held on April 7 and 8. Attendees were presented a roadmap of the working group process. In addition, the project consultants facilitated working group conversations to identify conditions that characterize the current state in Cambridge. For working group meeting minutes, please check under the "Working Groups" tab. The project team is currently organizing the Net Zero Task Force Working Groups. Working Groups are charged with investigating the following topics in detail: regulation and planning approaches; incentives and financing tools; energy supply and offsets; and engagement and behavior change. For more information on the Net Zero Task Force Working Groups, check under the "Working Groups" tab. The second Net Zero Task Force meeting was held on Wednesday, March 5, 2014 at City Hall, Sullivan Chamber. Integral Group consultants provided an overview of best practices from other cities. In addition, the Task Force were presented a revised proposal for the Net Zero Task Force Working Groups. For more information on the Net Zero Task Force Working Groups, please check under the "Working Groups" tab. All other meeting materials may be found under the "Presentations & Meeting Materials" tab. The first Getting to Net Zero Task Force meeting was held on Tuesday, January 28, 2014 at the City Hall Annex. The Task Force was presented an overview of the scope and work plan for the year. In addition, City staff discussed other related Cambridge initiatives that support the vision of the Net Zero Task Force. For meeting minutes, please check under the "Presentations & Meeting Materials" tab. Upcoming public hearing - Tuesday, June 9 from 3:00 P. M. to 5:00 P. M.
The City Council's Health and Environment Committee, chaired by Councilor Leland Cheung, will be holding a public hearing to discuss the Net Zero Task Force's proposed framework for the goal of setting Cambridge on the trajectory to becoming a "net zero community". All are invited to attend. Upcoming City Council meeting of interest - Monday, May 4th 5:30 P. M., City Hall, 795 Massachusetts Avenue. The Net Zero Action Plan has been completed and submitted to the City Council as part of the City Manager's Agenda for Monday night's Council meeting. Join us for the last scheduled meeting of the Net Zero Task Force. After this meeting, the Task Force's recommendations will be submitted to the City Manager. It is anticipated that in early May the recommendations will then be forwarded to the City Council for discussion. Join us for a public forum on the Path towards a Net Zero Cambridge featuring the Net Zero Task Force and a presentation of the 25-year action plan for reducing greenhouse gas emissions from building operations citywide! The purpose of this forum is for the Task Force members to present their recommendations to the public followed by a question and comment session. This is an opportunity for the City to solicit public input on the Task Force's recommendations. Wednesday, March 4, 2015, 7:00 P. M. to 9:00 P. M.
Wednesday, February 11 2015, 6:00 P. M. to 8:00 P. M.
Wednesday, January 28 2015, 6:00 P. M. to 8:00 P. M.
Monday, January 12 2015, 11:30 A.M. to 1:30 P. M.
Wednesday, December 10, 6:00 P. M. to 8:00 P. M.
Wednesday, November 19, 6:00 P. M. to 8:00 P. M.
Public Forum: Getting towards Net Zero, 6:00 P. M. to 8:30 P. M.
Join us for a discussion at the Main Public Library, Lecture Hall, 449 Broadway: Getting towards Net Zero featuring guest panelists and big ideas for reducing carbon emissions from buildings. The purpose of this forum is for the City to present the Net Zero Task Force's preliminary ideas to the public followed by guest expert analysis and feedback in addition to public comment. Panelists will craft an objective response to the preliminary ideas and offer recommendations moving forward. This is an opportunity for the City to solicit public input on the preliminary ideas as well as receive feedback on issues of concern. Wednesday, September 17, 5:00 P. M. to 9:00 P. M. at Cambridge College, 1000 Massachusetts Avenue, 1st Floor Conference room. The entrance to the conference room is the door to the left of the main entrance. Wednesday, June 25 6:00 P.M. to 8:00 P.M. at the Citywide Senior Center, 806 Massachusetts Avenue. Please note the location change. Wednesday, June 4 6:00 P.M. to 8:00 P.M. at the Main Library, 449 Broadway in the Community Room, Level L2. Enter the main entrance of the library and take the elevator to Level "L2". *Please note the location change. Wednesday, May 14 6:00 P.M. to 8:00 P.M., Citywide Senior Center, 806 Massachusetts Avenue. Tuesday, May 6 8:30 A.M. to 10:00 A.M. City Hall Annex, 344 Broadway, 4th Floor Conference Room. Tuesday, May 6 4:00 P.M. to 5:30 P.M. City Hall Annex, 344 Broadway, 4th Floor Conference Room. Monday, May 5 8:30 A.M. to 10:00 A.M. City Hall Annex, 344 Broadway, 4th Floor Conference Room. Monday, May 5 4:00 P.M. to 5:30 P.M. City Hall Annex, 344 Broadway, 2nd Floor Conference Room. Wednesday, April 9 6:00 P.M. to 8:00 P.M. City Hall, 795 Massachusetts Avenue, Sullivan Chamber. Tuesday, January 28 6:00 P.M. to 8:00 P.M., City Hall Annex, 344 Broadway, 2nd Floor Conference Room. Jane Carbone, Director of Development, Homeowners Rehab, Inc. The Net Zero Task Force Working Groups are charged with completing a particular set of tasks over the course of the year to complement and support the development of a net zero plan for Cambridge. Working groups are comprised of Task Force members and community representatives with specific subject matter expertise. To view a list of the Working Group members, click here. The working groups will review and conduct, as needed, research and analysis to formulate preliminary recommendations within subject areas including regulation and planning approaches, energy supply and offsets, incentives and financing tools, and engagement and behavior change. The Task Force will provide feedback and ultimately determine which recommendations should be included in the plan. All working group meetings are open to the public. To view the Net Zero Task Force Working Group Starter Kit, click here. For more information on the Getting to Net Zero Task Force, please contact Susanne Rasmussen at srasmussen@cambridgema.gov or 617/349-4607.